In my job as a firearms instructor, it seems like every day I talk to people seeking information on a gun for home defense. From this regular discussion, and my law enforcement training, I’ve put together some factors to consider when narrowing down the “perfect” home defense gun for your home. Often times, a shotgun ends up being the go-to firearm for home defense, such as a basic pump action I recommend the Rock Island M30 M5 12ga shotgun. This is Rock Island’s throwback to the reliable and timeless High Standard Flite King shotgun built from 4140 ordinance steel. It comes standard with a polymer stock and forend, sturdy vented heat guard with 20″ barrel. It has a 5-round capacity with an additional two rounds in an internal shell caddy in the stock. This shotgun is finished with Rock Island’s rugged matte nickel coating and will keep working in the harshest environments. Chambered for both 2 3/4″ and 3″ shot shells. With an MSRP $223, it gives you a great capability at an affordable price. If taken care of properly, it’ll be passed on to your grand kids. When I talk to a person seeking a gun for home defense, I often ask them, how many people are inside the house, and might they have to use the gun? Many times, folks opt for a AR rifle, thinking that it’ll be their ultimate home defense gun, only to find out that they significant other is unable to use the gun safely. Or, the firearm they’ve chosen isn’t something their other family members are comfortable using. After making this discovery, they often come back to the store looking for fresh advice on an option that’ll work for multiple people in the home, should they have to use it. If you want to ensure that multiple members in your household are comfortable operating your chosen home defense firearm is to do a couple of things: Bring them with you when you’re picking out the gun in the first place. Have them manipulate it in the store to see if it’s something they could see themselves using, if they had to. Also, once you’ve made your purchase, spend some time with your family members to teach them how to operate it safetly. Take them to the range and get them comfortable shooting it. That way, if danger visits your home and they are forced to defend themselves, they’re in a better position to utilize the defense tool you’ve provided. If you’re choosing a gun for home defense, that means that if you need to use it, you’ll likely be shooting the firearm inside of a bedroom or in a hallway. Operating in close quarters like that makes two elements of firearms use more significant: maneuverability (which I’ll get to in a minute) and noise level. Take it from me, I have fired both an AR-15 and a 12 gauge inside of a house without hearing protection, and you really don’t have an appreciation for just how loud shooting is til you fire off a gun inside of a tight hallway or bedroom. For the first 30 seconds or so, there is a loud ringing in your ears. You really can’t hear much besides that ringing, much like the effect used in the movie Saving Private Ryan where Captain Miller looks spaced out stumbling onto the beach after a surviving a nearby mortar blast. This reason alone is one reason why I recommend either considering a pistol, a suppressor, or simply keeping ear protection with your home defense option. When you are clearing rooms in the house and cornering, it is more challenging to use a long gun such as a rifle or shotgun. During my police academy training, we trained in a shoot house to learn to clear rooms. In that training, I quickly found that using a pistol made it easier for me to maneuver around the close spaces of hallways and from around corners. Also, when clearing a room, a shotgun or rifle generally requires the use of both hands. Based upon training I received through the Florida Department of Law Enforcement, having both hands occupied when clearing a house becomes dangerous if faced with a hand to hand fighting situation, and adds a challenge to interacting with the environment, for example, opening doors. One additional element to consider with a long gun is just that: a longer gun extends further beyond your person. Say for example, you’re about to round a corner. The end of the barrel of your rifle or shotgun will turn that corner before you. This could be a problem if an attacker uses that opportunity to grab that barrel and at best, deflect it, or at worse, disarm you. 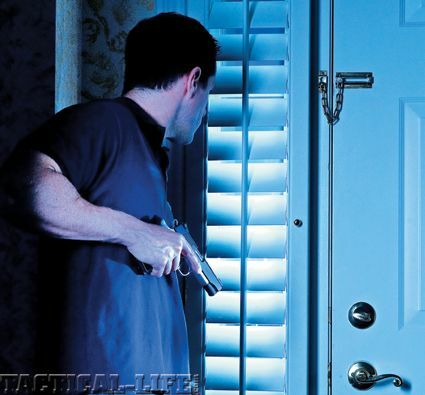 Finding a home defense gun with a shorter reach helps to minimize that risk. Get your own M30 M5 from armscor.com.